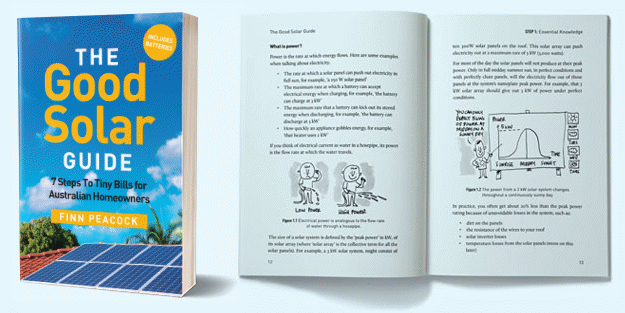 In Part #1 I went into great detail about why the “Max Power” quoted on your solar panel specification sheet and the real max power you will actually get from that panel are very different numbers. I showed you how to calculate a more accurate max power by using some little known temperature specs. In this post I’ll go through the other important numbers that you should look at when comparing solar panels. The solar panel specification sheet, looks a bit scary at first glance, with lots of curves and about 2 dozen numbers with techno-babble labels. The good news is that only 4 of these numbers actually need to be understood by you – the consumer. The other numbers are for the (CEC accredited) solar designer to use to make sure that he uses the correct panels in the correct wiring configuration with the correct inverter. This is the number that everyone refers to as the “size” of the solar panel. e.g. 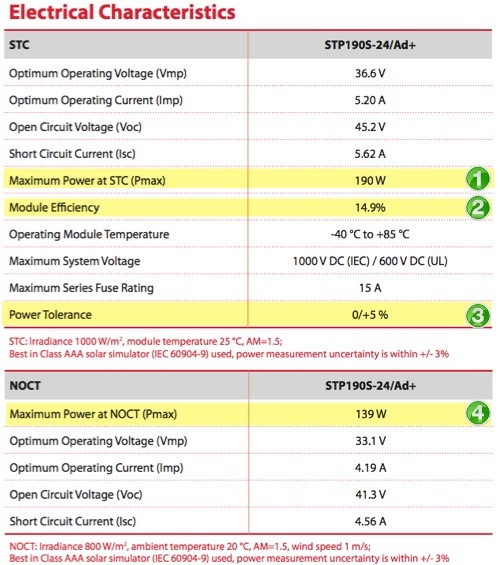 a 190W solar panel has an “STC maximum power” of 190W. I went on at great lengths in my previous blog post as to why this number is very optimistic to put it mildly! Some solar panel data sheets also list “cell efficiency”. Don’t get module and cell efficiency mixed up! Cell efficiency if the efficiency of the solar cell (the beermat sized black/blue piece of silicon – many of which make up a single panel) in isolation. Solar Panel efficiency is the efficiency of the panel as a whole and will always be slightly lower than the cell efficiency because of the gaps between individual cells. Most panels should have an efficiency of 13% or more. Unless you absolutely need to squeeze as many panels as possible onto your roof, then don’t worry too much about this number. I’ve written a whole blog post about why solar panel efficiency isn’t the most important factor and you can read it here. 3) Power Tolerance – This is the range within which a panel manufacturer is saying the module can deviate from its specified STC max power. For example: if you had a -10%/+10% power tolerance on a 200W panel, the actual panels on your roof could have actual max Powers of between 180W and 220W. These days it is increasingly common to have a 0% negative power tolerance. Which means that the panel will always have a rated STC max power greater than or equal to the specification. I would argue that a 0% negative power tolerance is also a good sign that the panel manufacturer has got a good handle on its quality control and manufacturing processes. So my advice is – be choosy and look for panels with a 0% negative power tolerance. Not all data sheets have this number – but most reputable brands will list it. If it is not listed, that may be a sign of a not-so-great panel manufacturer. This number is the maximum power of the panel when tested in harsher conditions than the STC max power. It is the power with less sun, and at higher panel temperatures. It will typically be between 70-75% of the STC power. It is useful because it takes into account how much power is lost due to increasing temperatures. If you want to quickly get an idea of which panels will give you more power in reality – even though they have the same STC max power – then choosing the panel with the highest NOCT max power should give a fair indication of the best one for the hot Aussie conditions. It does, of course, depend on the manufacturers’ specs being truthful! So there you have the 4 numbers that you need to know if you want to compare solar panels before buying. If you think there is a critical spec that I’ve missed out then let rip in the comments. Next Article: What is solar tower technology? I am designing a PV system for my home in HI. The average daytime temp is 82F. A solar radiation map of my part of the island shows that I have 7 solar hours per day on the average. (Yes, its a very sunny area!) With a roof installation, the panels will get very hot during the day. At an ambient temp of 29.4C (85F) and an NOCT of 45C (representative of better PV panels), I calculate a pv module temp of 54.5C, much hotter than the 20C ambient temp at which NOCT is measured. (Pmax) [W] at NOCT doesn’t seem to correlate as expected with the temperature coefficient of Pmax. For instance, the maximum power (Pmax) [W] at NOCT is 200 W for Samsung’s LPC250SM and 188.9 W for Sanyo’s HIT-H250E01. That is 5-6% less power at NOCT for the Sanyo compared to Samsung 250w panels. At the much hotter ambient temperatures on my roof, the difference would even be greater. However, from the temperature coefficient of Pmax [%/°C) for Samsung LPC250SM at -0.48 and for Sanyo HIT-H250E01 at -0.3, I would have expected the Sanyo 250 to outperform the Samsung in the heat. Why is the Sanyo HIT-H250E01 maximum power (Pmax) [W] at NOCT less than the Samsung LPC250SM? The NOCT and Pmpp are the temperature specs they are about average. Before getting into PV solar I was quite aware of all the different issues that would affect true panel power/daily energy output, such as angle, time of year, dust, age, temperature, cloud etc etc. But as soon as I had my system running, one popped up that I had never known of: ‘STATE CODE 567’. I see this almost daily, with a message to the effect that my inverter has to derate itself when this happens. Apparently this is due to my electricity provider not properly regulating voltage. Is that a true understanding? What can be done about it or do I just have to accept this as another factor affecting true output? For Fronius inverters at least, CODE 567 means the grid voltage went too high and so the inverter output was reduced to help keep the grid within safe limits. (This is an example of how solar power assists in maintaining grid stability.) If the derating is happening for excessive periods of time you can complain to your network distributor and they may do something about it. e.g. a 250W solar panel has an “STC maximum power” of 190W. Good catch, Chris. That was a mistake and I’ve just corrected it. It should have said a 190W solar panel has an STC maximum power of 190W.